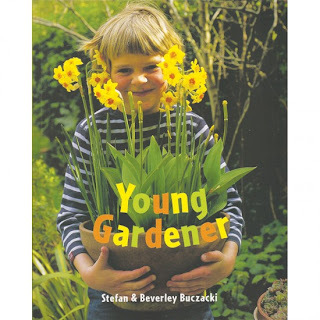 The Young Gardener by Stephan and Beverly Buczacki is a fabulous gardening and activity book for families, homeschoolers, and educators. Together the authors have over 75 years of experience! How they were able to condense that knowledge into a 116 page book suitable for children is amazing. And what shows throughout the book is a love and passion for gardening, backyard animals, crafts, and children. The book is divided into seasons, including early, middle, and late seasons. 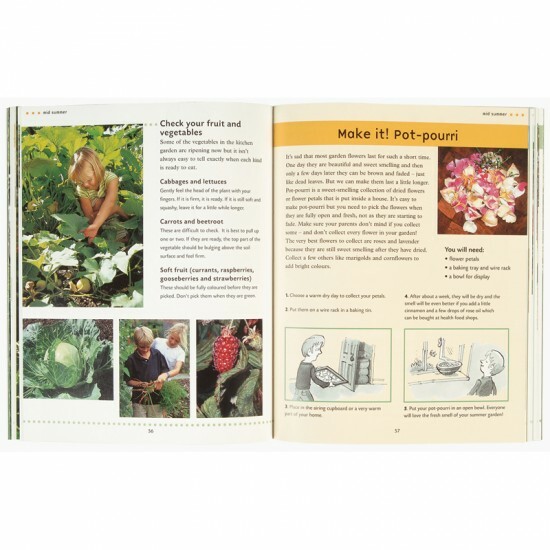 Each of these sections include "What's going on in the garden? "; "What's happening to the plants? "; "What can I do in the garden? "; and "Make it!". The suggested activities are seasonal and include 1) a list of what you will need, 2) a few photos, and 3) helpful drawings to illustrate what to do. Happily, the majority of activities don't require spending a lot of money! Another terrific feature can be found at the end of each section called "...Check IT!". Here you will find a check list and some lovely photos of "top plants" for that season. I really enjoyed reading each section and I learned some new facts, like when to prune rose bushes and when to prune fruit trees. The "Make it!" feature is especially helpful and gives the reader more in depth instruction for making a special project for the home, gifts such as a sunflower garland, spore prints, and egg-heads. These gifts could also be made in a classroom with access to a larger school garden. The end of the book has a glossary of terms and a generous index. I found this book to be well rounded and a pleasure to read: It's educational, a helpful how-to, has wonderful photos and drawings, is beautifully laid out, and at 116 pages, not overwhelming and burdensome. The quote in the introduction sums it up best: "Gardening is about sharing--sharing the space with the plants and animals, and sharing the garden with our family and friends." I highly recommend this book for children who want to garden, do crafts, and or who just want to learn about plants and animals in their own backyard. 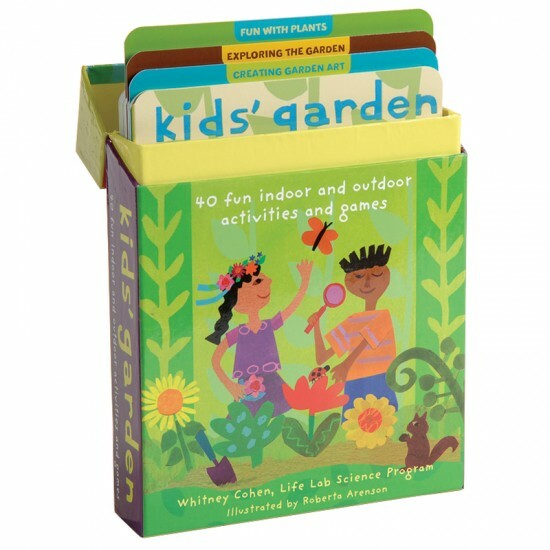 Another wonderful gardening treasure is kid's garden, 40 fun indoor and outdoor activities and games created by Whitney Cohen of the Life Lab Science Program, and illustrated by Roberta Arenson. Kid's garden comes in a lovely box filled with "easy-to-follow" cards in "5 color-coded categories": Exploring the Garden; Planting and Growing; Fun with Plants: Discovering Creatures: and Creating Garden Art. 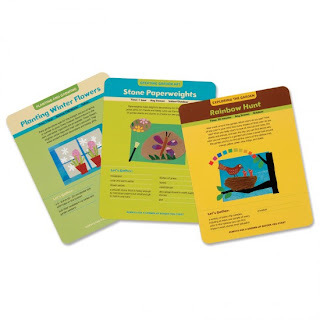 This set of cards also includes an insert with information on garden tools and staying safe. On the front of each card there is an estimate of how long the activity takes, which season to do it in, and whether it is an indoor or an outdoor activity. There is also a colorful and simple child-like drawing and a "Let's Gather" list of materials needed printed on the card. 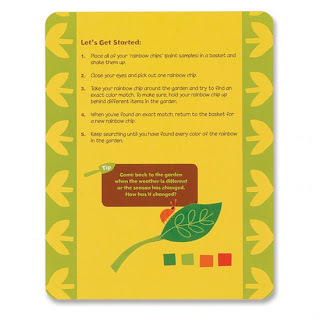 The back of the card features the heading "Let's Get Started" followed by step-by-step instructions. Lastly, at the bottom of each card there is a tip for the activity. Kid's garden would make a terrific addition to your collection of children's gardening books and activities: the cards are easy to wipe off, they are colorful and attractive to young children, and they are easy to use. Some of my favorite activities include Paper Pots; Planting a Pizza Bed; Planting a Rainbow; and a Squirmin' Worm Inn. Although several of the cards contain very common, tried and true activities, like making mud pies, flower bouquets, and stone paperweights, it is still a nice reminder of what we did as children outside in the garden. To learn more about these gardening products: they are listed on Amazon--they are no longer available at Montessori Services. 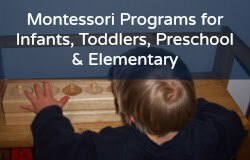 I received a free copies of these items for the purpose of writing a review from Montessori Services, and with whom I am also an affiliate. I get a small commission if you purchase the book, or any other materials, from the links provided in my blog. Thank you! Gardening items from Montessori Services that I've purchased and highly recommend are 1) the Radio Flyer Child-Size Wheelbarrow, 2) the Child-Size Leaf Rake, 3) and the Stainless Steel Compost Pail.